Kre-O G.I.Joe KReons Wave 5 Hits US Retail! Good news, Kre-O G.I.Joe Fans! 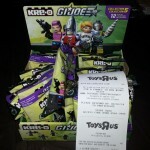 Wave 5 of Kre-O G.I.Joe Kreons has been found at U.S. retail! This particular sighting and subsequent purchase was made by Hisstank.com forum member bigredmachine17 in the great state of Utah. Where’s Wave 4? – Don’t know. Hopefully it’s being released sometime soon as well, perhaps there was a shipping error/issue and the waves were swapped…but this is all speculation on our part. Either way, new Kre-O G.I.Joe figures are here, so who cares what order the waves are in! What are the bag codes? – Well, after finding out that blind bag codes were removed from Transformers Kreon packages, we knew it wouldn’t be long before the same happened on our side of the fence. Wave 5 is confirmed to have no blind bag codes! Looks like there’s going to be a lot of trading and eBay selling going on. G.I. 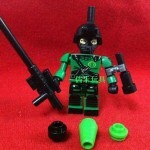 Joe Kre-O Kreon Production Sample Images Wave 4 and 5! 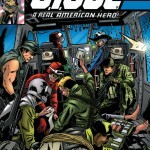 Another issue of IDW‘s GI Joe A Real American Hero is due out tomorrow and we’ve got the preview! Torpedo and his team race against the clock in the mountains of Olliestan, with Dr. Adele Burkhart in tow. Will they make it out in one piece or will the pursuing insurgents take down our Real American Heroes? 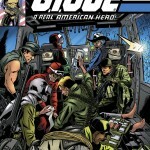 We have with us, the IDW August 2014 G. I. Joe Solicitations.